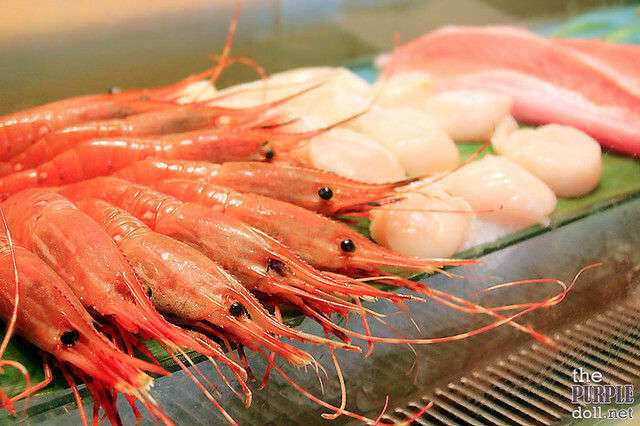 Aside from being a city of gaming and shopping, Macau is also a destination for dining. 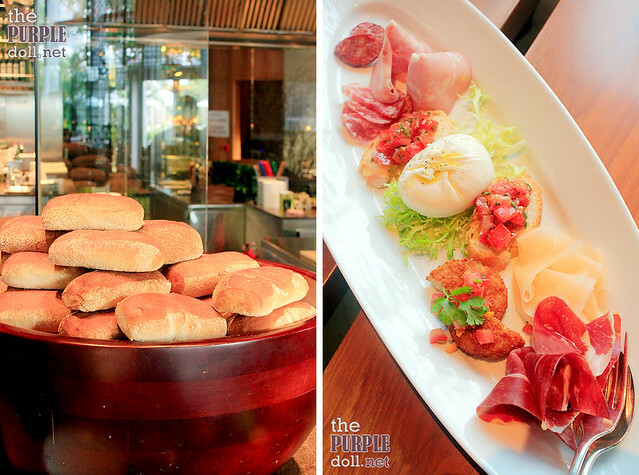 For the three days we've stayed at City of Dreams Macau, we've been spoiled to nothing short of gustatory delights. And for a taste of widely varied international favorites, there's no better place to dine in but at mezza9 in Grand Hyatt Macau. 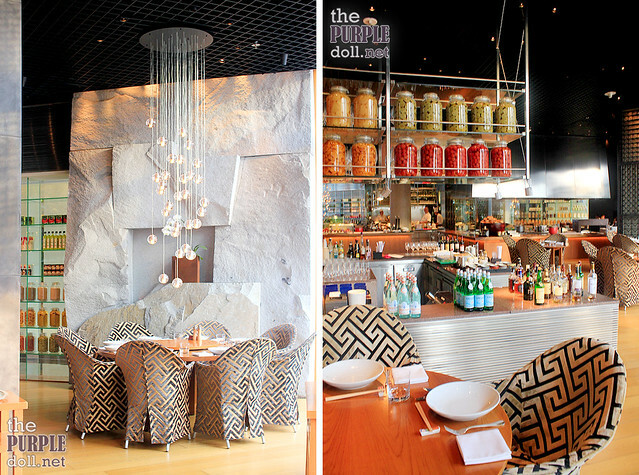 Taking inspiration from the famous mezza9 at Grand Hyatt Singapore, this Macau version, located at Grand Hyatt Macau's third level, also offers different wining and dining experiences all under one roof. 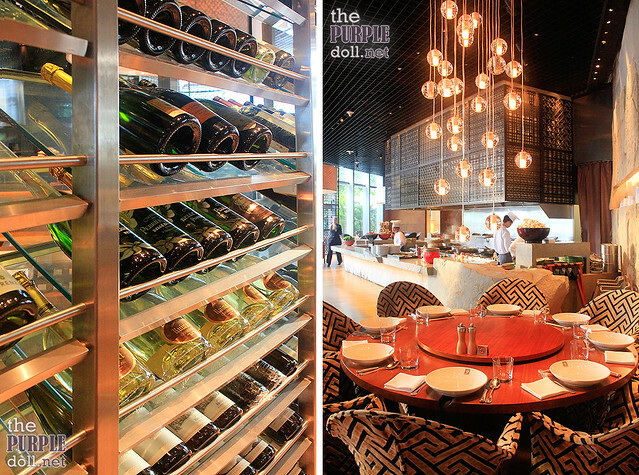 From contemporary Western to colorful Pan-Asian flavors, mezza9 has them all -- Macanese, Grill, The Sushi and Sashimi Bar, The Wok, The Steam Basket, The Deli, The Pâtisserie, The Wine Cellar, and Bar. So for couples and groups with varying tastes and different sets of cravings, this is the place to be. 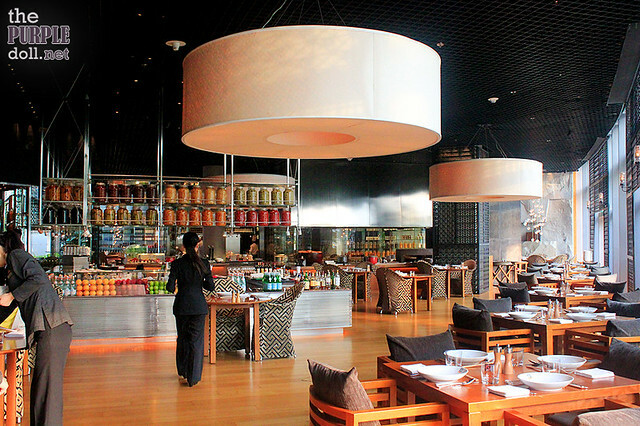 With multifaceted food selections and different sets of theatrical show kitchen, mezza9 is one big restaurant which can comfortably sit 292 guests. You can choose to sit anywhere in its spacious main dining area, on the outdoor terrace, in one of four semi-private Japanese wood-lined booths, or in one of three 10 to 12-seater private rooms, all of which are eclectic, highly textured and a feast to all the senses. First on our table was a bread basket. But even before I finished my piece, already came the platter of mezza9 Antipasto. And unlike the set of antipasto I'm used to, mezza9's comes in eight different kinds. My favorite? All the cold cuts, the burrata, and the very unusual but sweet and refreshing, thinly-sliced cantaloupe melon sheets. I totally forgot about my seafood allergies when this seafood opulence was served. 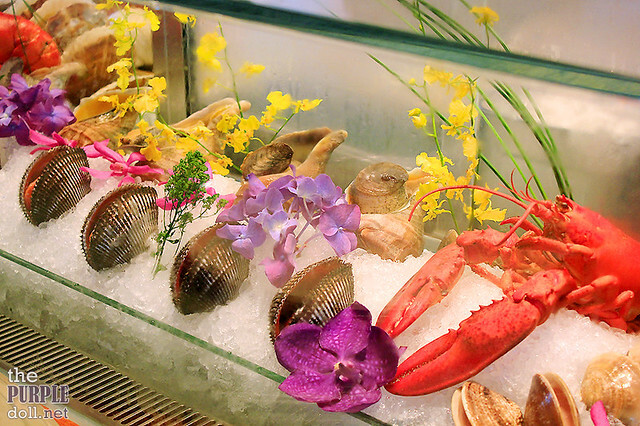 Coming in with a nice arrangement, this serving of Seafood on Ice had all my favorites! If only there were some scallops and oysters, I'll already feel like I'm in seafood heaven. (And probably die from seafood allergies?) But nonetheless, this appetizer course definitely made my palate party in joy. 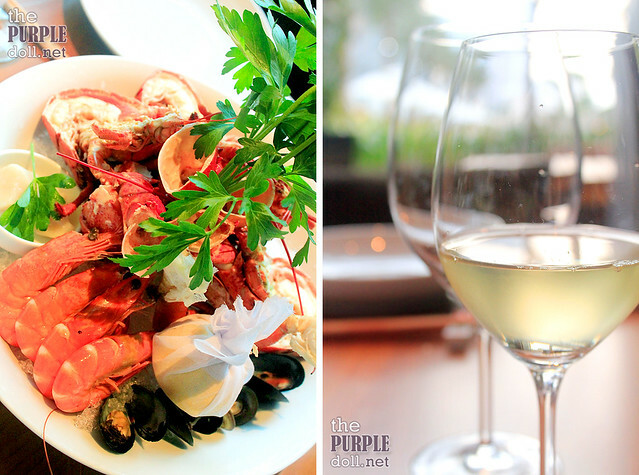 Even without an anti-histamine at hand, I had piece after piece of lobster, Alaskan snow crab leg, mussels and prawns. Yum yum yum! To follow the cold seafood fest, we had a hot bowl each of this very comforting and nutritious Chinese soup made from pigeon which is believed to nourish the lungs, improve complexion and eyesight, and regulate functions of vital organs. 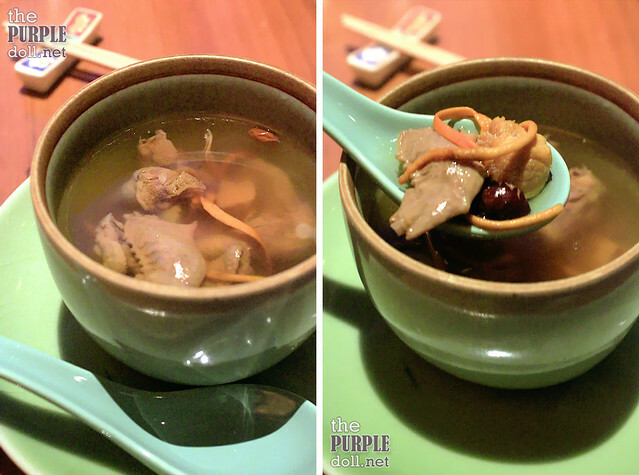 From what I know, pigeon soup is normally served to the elderly, operation patient or pregnant women in Chinese culture. And every spoonful brought a really cozy feeling, which somehow reminded me of my favorite black chicken in four-herb (sibut) soup, but lighter and better. Normally, I'd ignore this dish since I'm not a big fan of any deep-fried fish. However, this serving of Deep-Fried Soon Hock in Soya Sauce definitely changed my status quo. Apart from the savory sauce, the freshwater fish itself is the reason for my raving. This is the first time, that I know of, to try Soon Hock which also goes by Marble Goby or Lazy Fish. I'm not so sure if its being lazy (only moves to catch food in front of its mouth) is the reason behind its juicy, delicate meaty taste, but I honestly can't get enough of it! 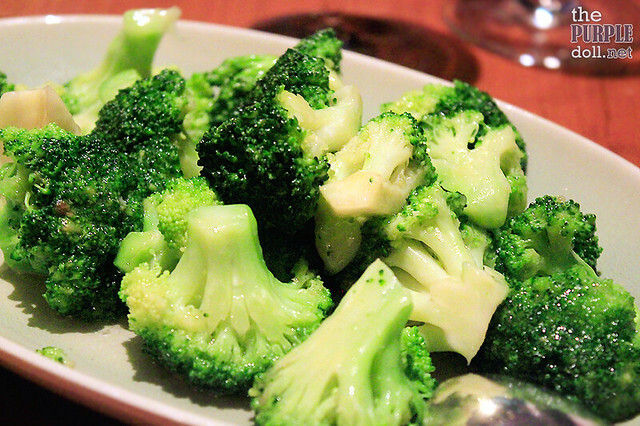 Since the name says "seasonal" it's best to ask your server what green vegetables they have on your visit, to be sure. As for us, we had this serving of stir-fried broccoli from The Wok that went well with the meats and even the Soon Hock dish we had. I think I downed a good number of broccoli pieces that night since I love broccoli like that. Easily the highlight for any carnivore, this board of Charcoal-Grilled Mixed Meat has three succulent and meaty treats, plus one surprise from the chef, which in our case were flavorful sausages. Every element on this board were nothing short of great -- juicy, tender and savory, cooked to my preferred medium rare to medium doneness too! To go with the meats, we had some Sautéed Mixed Mushrooms on the side. And while I enjoyed the meats, I found myself a little more engrossed with this side dish. Even my tablemates agree that this mushroom dish is excellent! From what I recall, it had enoki, shimeji, shiitake, eringi mushrooms and more. Definitely a mushroom lover's must-try! For a taste of Macanese cuisine, we had the Arroz de Pato à Macanese, one of the many dishes that display the influence of Portuguese flavors in Macau. At first, I thought it would be similar to paella. But I was wrong. 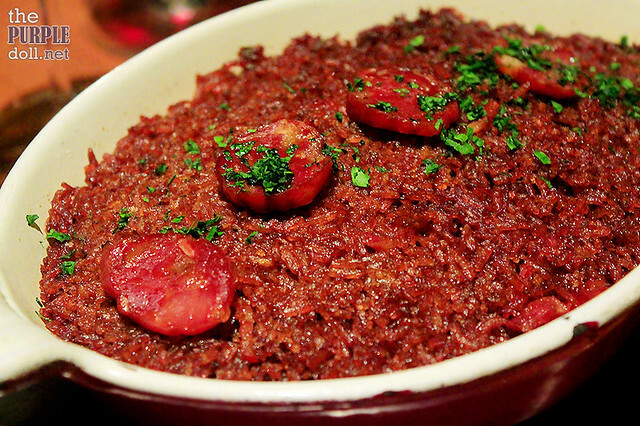 This dish is made from rice simmered in duck fat and stock, and baked with duck confit and chorizo. Every mouthful oozes of savory flavors, and the slightly sticky texture of the rice reminded me of 粽子 or more commonly known as ma-chang in the Philippines. And unlike paella which has crisp, burnt rice at the bottom, this has the crisp, slightly burnt part on top instead. Dessert people like me have it hard 'cause we want to try a whole lot but might not have the cash or the tummy space. And I'm sure glad mezza9 understands this and offers the mezza9 Dessert Platter on their menu. I'm not too sure if this set will answer the problems of those with smaller tummy space though. Because even with supposedly-sample sizes, the serving is still huge! Good enough to be shared by four to five people, this platter has five kinds of desserts to end the meal on a sweet note. As for my favorites, it'd be the dark chocolate tart followed by the coffee-licious tiramisu. 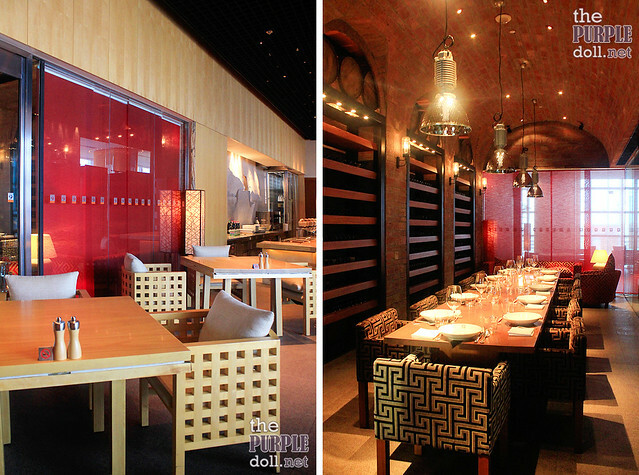 Located inside the Grand Hyatt Macau, it was already expected that ambiance would impress. However, what I didn't expect was the generous serving portions of the food. Let's be honest, hotel dining in Manila is probably synonymous to good but smaller-portioned food. But not at Grand Hyatt Macau's mezza9. 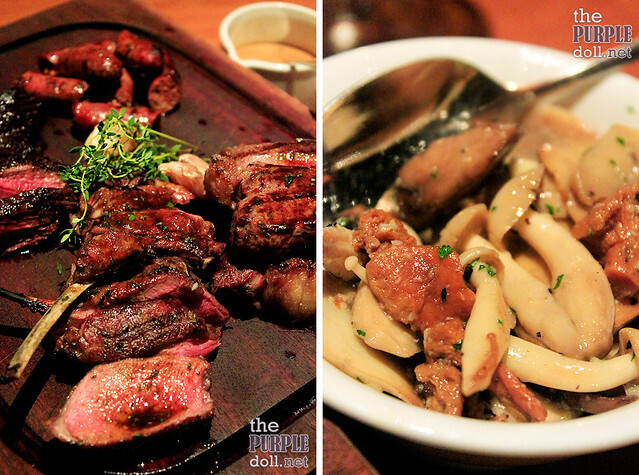 Apart from being plentiful, everything we had that night also hit the spot flavor-wise. 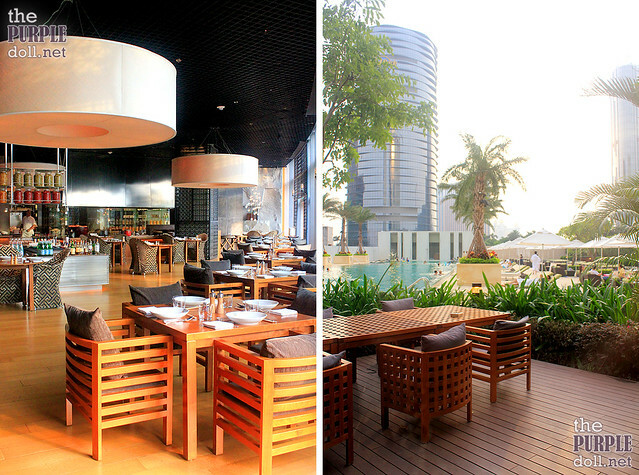 So if you're visiting City of Dreams Macau and want to indulge your senses, then definitely try mezza9. 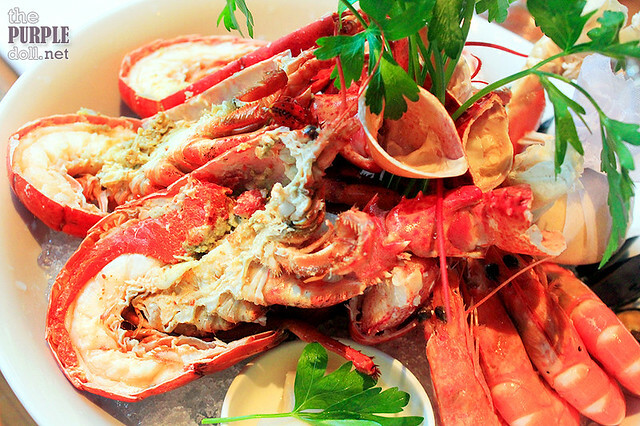 They have set menus perfect for couples, and offers Sparkling Sunday lunch on Sundays (duh). I'm very lucky, indeed! ^^ Believe it or not though, as good s the meats look and taste, I was more into the other dishes. They were THAT good! 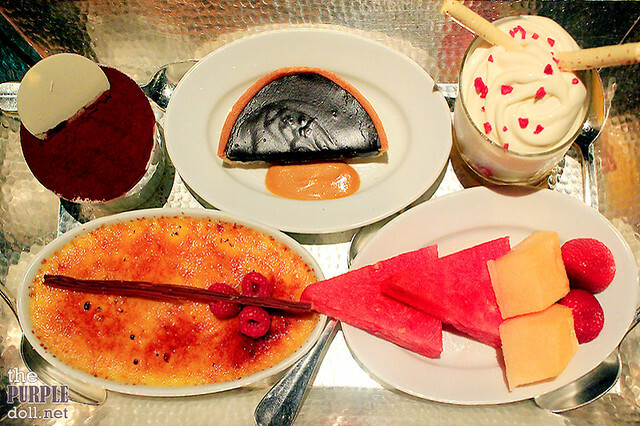 Oh wow everything looks intricate, delicious and extravagant! 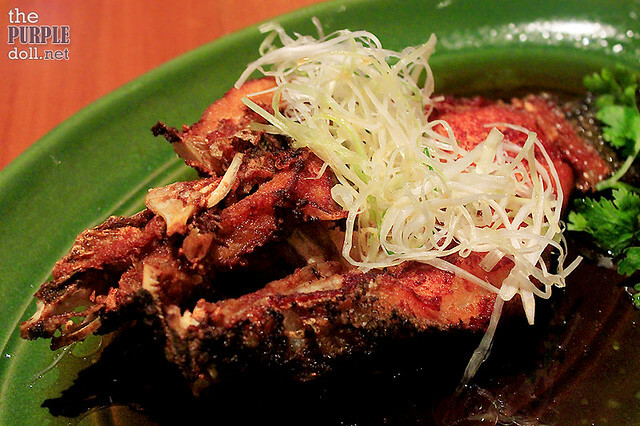 These dishes are great to be shared with family and friends when visiting Macau. :) I just hope that they'll come up with some discounts/promotions at the time when we plan to go there haha. mezza9 actually offers set menus for 2 that can actually be good enough even for 3 to 4. :) Give it a try when you visit Macau! The set menu's a great way to try different dishes and indulge for a little less. Seafoods looks yummy and the place of course, very extravagant. Hope that more menu lines are on the making. Lovely resto, and the dishes look appetizing! I'll keep Mezza9 in mind if and when we happen to visit Macau in the near future. Thanks for the heads-up!